Ottawa | Reuters — There is “an awful lot of affection for Canada” around the world that will help the government’s push to diversify exports away from the United States, the country’s new trade minister said on Thursday, as ties with Washington become more strained. 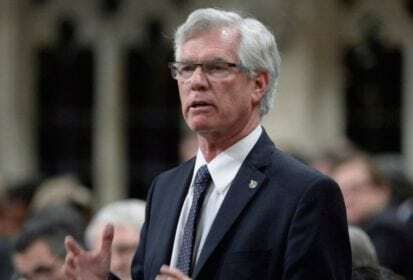 Winnipeg MP Jim Carr, previously the minister for natural resources, received the trade portfolio in a cabinet reshuffle on Wednesday, when Prime Minister Justin Trudeau said finding new export markets was a priority. Canada sends 75 per cent of its goods exports to the U.S., which imposed tariffs on Canadian steel and aluminum at the end of May and is now mulling punitive measures against autos. “There is goodwill towards Canada, there is a willingness to hear our story, and I think there is an awful lot of affection for Canada, for our values… for our political leadership,” Carr said in a phone interview. Although Trudeau took office in November 2015 stressing the need to boost trade with major emerging markets like China and India, the government has had little success. Trudeau visited Beijing last December but the two sides failed to agree on the launch of talks on a free trade treaty. Officials say negotiations on a potential deal with India have stalled. Carr, whose title is trade diversification minister, did not give details when asked about his travel plans for the next few months. He said he had not spoken to his U.S. counterpart, U.S. Trade Representative Robert Lighthizer. “The reality is that 75 per cent of our trade goes to the United States and it continues to be our most important trading partner,” he said. A senior Canadian diplomat on Thursday told a U.S. Commerce Department hearing into the auto tariffs that if Washington imposed the measures, Canada would respond with sanctions. Brian Kingston, vice-president of international issues at the Business Council of Canada, said Ottawa should launch trade talks with China and consider boosting ties with other Asian nations. “We are literally standing at the edge of a cliff now and if we don’t start trying to make some headway on diversification, we’re even more at risk than we were before,” he said by phone. In several tweets Thursday, Carr reiterated Canada is “absolutely on track to be among the crucial first six” member nations to ratify the Comprehensive and Progressive Agreement for Trans-Pacific Partnership (CPTPP). The CPTPP trade pact can only enter into force 60 days after at least six of the 11 signatories’ governments ratify it. For the remaining five nations, the deal would enter into force 60 days after the date of their respective ratifications. For Canadian farmers, a CPTPP deal would grant preferential market access to member countries including Japan, Vietnam and Malaysia, where Canadian exports now face tariff walls. Export-oriented farm commodity groups have pressed for Canada to be in the first tranche of signatories to ratify the deal. — David Ljunggren is a Reuters political correspondent in Ottawa. Includes files from AGCanada.com Network staff.